Toyota Alvar Apr.20 Hokkaido L.
Hiroshima D Apr.19 Kumamoto V.
Al Ittihad Jeddah (SBL) tabbed experienced 34-year old American forward Herbert Hill (208-84, college: Providence). He played most recently at Nishinomiya Storks in Japanese B League. In 31 B1 League games he averaged 13.8ppg, 6.6rpg and 1.8apg last season. 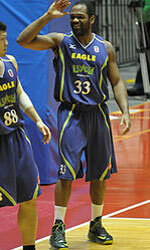 Hill also played for Toyotsu (B2 League) in Japanese league where in 28 games he had 13.1ppg, 7.8rpg, 1.7apg and 1.1bpg. In 2007 he was drafted by Utah Jazz (NBA) in second round (55th overall). Hill attended Providence College and it is his twelfth (!!!) season in pro basketball. Among other achievements his team made it to the Korean KBL Semifinals in 2011 and 2017. Hill was selected to Korean KBL All-Star Game back in 2012. He is a very experienced player. And here thanks to pro basketball Hill experienced life in nine different countries playing on three different continents. He is familiar with Asian, Latin American and of course North American leagues. Hill has played previously professionally in Bahrain, China, France, Korea (Mobis Phoebus, KCC Egis and KT Sonicboom), Lebanon (Tadamon and Champville), Philippines, Puerto Rico, Venezuela (Panteras and Gigantes) and Vietnam (Saigon Heat). Shows good mobility, running the court with ease. Has worked hard to improve his touch around the basket. Possesses great hands, capable of catching most passes without fumbling or losing control of the ball. Solid rebounder who uses his long arms and hands to tip balls out of position to himself. Solid finisher where he wastes little time, keeps the ball high and goes right up. This lack of strength can work against him when he faces physical forwards limiting his ability to get good position in the post. Can be stunted by double teams as he doesnt always read the defense quick enough to react. 34-year old center Hilton Armstrong (210-C-84) put on an extraordinary performance in the last round for second-ranked Nagoya DD and receives a Interperformances Player of the Week award for round 58. He had the game-high 25 points adding nine rebounds and two assists for Nagoya DD in his team's victory, helping them to outclass Shiga L-Stars (#5, 18-40) with 27-point margin 92-65. Nagoya DD maintains the 2nd position in their group in Japanese league. Nagoya DD is a typical solid league team placed somewhere in the middle or a little bit lower in the standings. They need more victories to improve their 31-27 record. Armstrong just recently signed at Nagoya DD, being already a very valuable addition to the team. University of Connecticut graduate has very impressive stats this year. Armstrong is in league's top in rebounds (6th best: 11.6rpg) and averages solid 1.9bpg and 63.0% FGP. Second best performed player last round was Davante Gardner (203-PF-91) of top-ranked Niigata Albirex. He is American forward in his 3rd season at Niigata Albirex. In the last game Gardner recorded impressive double-double of 26 points and 15 rebounds. Of course Niigata Albirex cruised to a 84-74 relatively comfortable win over slightly lower-ranked Kawasaki BT (#2, 38-21). It was definitely game of the week between two contenders to the top position in Central. Niigata Albirex consolidated its place in the very top position of the standings. His team has currently 43-15 record. Gardner is one of the most experienced players at Niigata Albirex and has a reputation of one of team's most reliable players. He belongs to the best scorers in the league with 27.8ppg (#1). His other stats are also decent: 11.0rpg and 3.8apg. Third place about best performers goes to forward Justin Keenan (202-F/C-88) of Akita NH (#5). Keenan scored 27 points and grabbed twelve rebounds (!!!). He was a key player of Akita NH, leading his team to a 73-44 easy win against slightly lower-ranked Hokkaido L. (#6, 10-48). Akita NH can only dream about fighting for top spots in East. They have rather bad season and 17-41 record places them close to the bottom of the standings. Too bad for Keenan he does not play for a better team. But maybe if he did, his season stats would not be that high. Keenan has individually a great season in Japan. After 51 games, he made it on the list of the league's leaders in points with 22.7ppg (4th best). 31-year old forward Jerome Tillman (201-F-87, agency: Inception Sports) put on an extraordinary performance in the last round for second-ranked Sendai 89ers and receives a Interperformances B2 League Player of the Week award for round 58. He had the game-high 32 points adding nine rebounds for Sendai 89ers in his team's victory, helping them to beat Gunma (#1, 42-16) 97-86. Sendai 89ers maintains the 2nd position in their group in Japanese B2 League. They would have been even better if they hadn't lost a few games earlier this season. Sendai 89ers will need more victories to improve their 38-20 record. In the team's last game Tillman had a remarkable 77.8% from 2-point range. He turned to be Sendai 89ers' top player in his first season with the team. Ohio University graduate has very impressive stats this year. Tillman is in league's top in points (8th best: 22.3ppg) and averages solid 56.2% FGP. Second best performed player last round was Gregory Echenique (206-C-90, agency: Pensack Sports) of league's second-best Shimane SM. He is Venezuelan center in his first season at Shimane SM. In the last game Echenique recorded impressive double-double of 18 points and 21 rebounds. Of course he led Shimane SM to another comfortable win 84-68 over slightly lower-ranked Ehime OV (#4, 20-38) being unquestionably team leader. 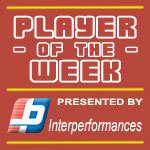 It was definitely game of the week between two contenders to the top position in West. Shimane SM consolidated its place in top 2 of the standings. His team's 42-16 record is not bad at all. Echenique is a newcomer at Shimane SM and quickly became one of team's most reliable players. Third place about best performers goes to forward Josh Hawkinson (208-F-95) of league's second-best Toyotsu FE. Hawkinson showcased his all-around game by recording 23 points, twelve rebounds (!!!) and six assists in the last round. He was a key player of Toyotsu FE, leading his team to a 73-72 win against #1 ranked Shinshu BW. Toyotsu FE needs these victories very badly if they think about taking over top position in Central. Their record at this point is 40 victories and 18 lost games. Hawkinson has a very solid season. In 52 games in Japan he scored 21.0ppg. He also has 10.4rpg, 3.5apg and FGP: 59.4%.